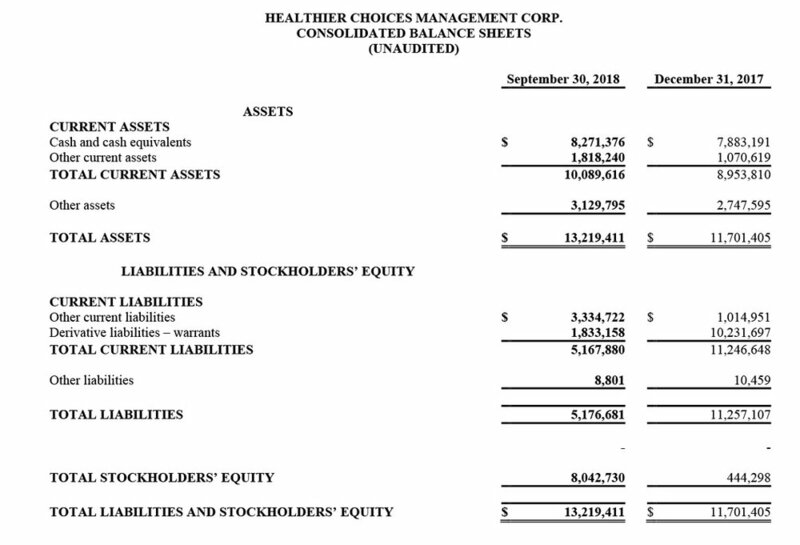 HOLLYWOOD, FL, October 26, 2018 /PRNewswire/ -- Healthier Choices Management Corp. (OTC Pink: HCMC) today announced financial results for the three-month period ended September 30, 2018. · Net sales from continuing operations for the three-month period ended September 30, 2018 amounted to $3.0 million, compared to $2.9 million during the same period last year; a 5% increase. · Gross profit from continuing operations increased by approximately $108,000 for the three-month period ended September 30, 2018 amounting to $1.4 million, compared to $1.3 million for the same period last year. Operating loss for the three-months ended September 30, 2018 was approximately $800,000 a reduction of roughly $2.2M for the same period in 2017; a 74% improvement. Net loss from continuing operations amounted to approximately $11.3 million; due to the non-cash elimination of the Series A warrants which amounted to $10.7 million. $2.0 million deposit from the MJ Holdings, Inc. (OTC Pink: MJNE) distribution agreement will not be recognized as revenue until the Fourth Quarter of 2018. The following discussion and analysis contains a non-GAAP financial measure. Generally, a non-GAAP financial measure is a numerical measure of a company’s performance, financial position or cash flows that either excludes or includes amounts that are not normally included or excluded in the most directly comparable measure calculated and presented in accordance with GAAP. Non-GAAP financial measures should be viewed as supplemental to, and should not be considered as alternative to, net income, operating income, and cash flow from operating activities, liquidity or any other financial measures. Non-GAAP financial measures may not be indicative of the historical operating results of the Company nor are they intended to be predictive of potential future financial results. Investors should not consider non-GAAP financial measures in isolation or as substitutes for performance measures calculated in accordance with GAAP. We define Adjusted EBITDA as loss from operations adjusted for non-cash charges from depreciation and amortization and stock compensation. Management believes Adjusted EBITDA is an important measure of our operating performance because it allows management, investor and analysts to evaluate and assess our core operating results from period to period after removing the impact of significant non-cash charges that effect comparability between reporting periods. Our management recognizes that Adjusted EBITDA has inherent limitations because of the excluded items. Healthier Choices Management Corp. is a holding company focused on providing consumers with healthier daily choices with respect to nutrition and other lifestyle alternatives. One segment of our business is our natural and organic grocery operations in Ft. Myers, Florida. Another segment is a U.S. based retailer of vaporizers and e-liquids. HCMC sells direct to consumer via company-owned brick-and-mortar retail locations operating under "Ada's Natural Market" and "The Vape Store" brands. The newest emerging source of revenue for HCMC is our technology and IP to the cannabis and CBD market. This press release contains forward looking statements within the meaning of that term in the Private Securities Litigation Reform Act of 1995 (Section 27A of the Securities Act of 1933 and Section 21E of the Securities Exchange Act of 1934). Additional written or oral forward-looking statements may be made by the Company from time to time in filings with the Securities and Exchange Commission or otherwise. Statements contained in this press release that are not historical facts are forward looking statements made pursuant to the safe harbor provisions of the Private Securities Litigation Reform Act of 1995, and are based on management's estimates, assumptions and projections and are not guarantees of future performance. The Company assumes no obligation to update these statements. Forward looking statements may include, but are not limited to, projections or estimates of revenue, income or loss, exit costs, cash flow needs and capital expenditures, statements regarding future operations, expansion or restructuring plans, including our recent exit from and winding down of our wholesale distribution operations. In addition, when used in this release, the words "anticipates," "believes," "estimates," "expects," "intends," and "plans" and variations thereof and similar expressions are intended to identify forward looking statements.